My Aunt had tried to conceive for over a decade, when she and her husband decided to adopt a baby. The process took about a year, but they eventually had a beautiful six month old baby boy to call their own. I was only sixteen at the time, but the way Aunty Oge dotted on her son, you would never know that she didn’t carry him in her womb. The love was real! My Aunty who had practically stopped living at that stage of their TTC journey bounced back to her former self; she looked happy and healthier, and was at least eating now! Even her hair stopped thinning and breaking out. For her, Sochima was the answer to her prayers. I remember one day she was gushing about him, and till date, I have never forgotten what she said “Sometimes we pray to God, but His answers are not wrapped in the gift bags we want. Praying to an All-knowing God often requires that we keep an open mind”. For her, it wasn’t just about having her prayers for a child answered, it was about the life she had rescued her son from. Motherhood, has being blissful for her! His biological mother didn’t want him, and had dropped him at the gate of a convent. One of the Reverend Sisters at the convent worked as a doctor at the hospital my Aunt used, and she knew all about her TTC journey. After the baby was attended to, and checked medically, she called my Aunt and told her of the beautiful boy God had dropped on their doorstep. At that moment, it wasn’t just about having a baby to love and cater for; her heart was immediately filled with compassion for the boy! She couldn’t imagine how a human being could give up a baby, when she had given up her whole life to get one. So she said yes, and the paper work started. The part I do not understand and can only attribute to God’s mystery is how Sochima totally looks like my aunty right now; eyes, complexion, behavior, everything. You would think she spat him out! Motherhood is way beyond the blood ties. I remember when I was TTC and wanted so much to be a mother, my husband and I explored the option of adoption and gave ourselves a timeline. Like if we didn’t get pregnant at so and so time, then we would adopt a baby. I was so sold on the idea that even after having my daughter, we are still open to adoption and have promised God that we would adopt a baby eventually. The realization I have made is that being a mother isn’t solely about a baby growing inside you for nine months, and then birthing that child. I have a friend whose mother abandoned all four of them, after their dad died, and ran off with a boyfriend. My friend, the eldest, was only fifteen at the time, and found herself doing odd jobs to make money in order to feed her siblings. She got married at age nineteen to a guy she didn’t love, just because he was willing to put her siblings through school. After the wedding, her mother re-surfaced and proceeded to milk her and her husband. “She is still my mother” was what she told us whenever we tried to make her see how the woman was basically using her. Fast forward a few months later, when she had a baby and invited her mother for Omugwo, and this wonderful mother of hers requested for half a million naira, because according to her, her coming for Omugwo meant she was going to close down her shop for three months. She wanted her daughter and husband to pay her what profit she would have made in three months, and of course, they were also requested to pay in the money before she would grace their house with her presence. Scales fell off my friend’s eyes and today she says about the woman “She gave birth to me, but she is not my mother”. This friend is more of a mother to her siblings, than the woman that gave birth to them. 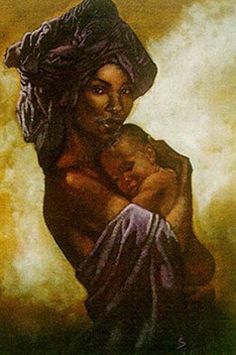 What makes a mother is the heart; the sacrifices she is willing to make for others and the abundance of love her heart carries. Pregnancy and childbirth are biological occurrences which, by no means, dictate who and who should be a mother. Today, lots of TTC couples are embracing the idea of adoption, and I think that is beautiful. It doesn’t stop you from trying to conceive, after all, your adopted baby would also appreciate having a sibling or two. Some children are born from the womb, some others are born from the heart. Opening your heart and home to a child is a blind path, and one that you walk through in faith, hope and love. It is a test that you can love unconditionally, and that you have enough love in your heart for another individual. God is still in the business of performing miracles; who knows what parcel His gifts would come wrapped in? I have added below, a beautiful poem I found online written by a woman Cheri, for her adopted son, Michael who she calls the light of her life. Enjoy!! or pinched on by tiny fingers. I never knew just how much I would love being a Mom. the total fulfillment of being a Mom. I didn’t know I was capable of feeling so much…Before I was a Mom. Previous articlePicture Time- Baring Bellies Or Not! Very inspiring and encouraging.our mission on earth is not only about giving birth,but about empowering the next generation whether biological or not.